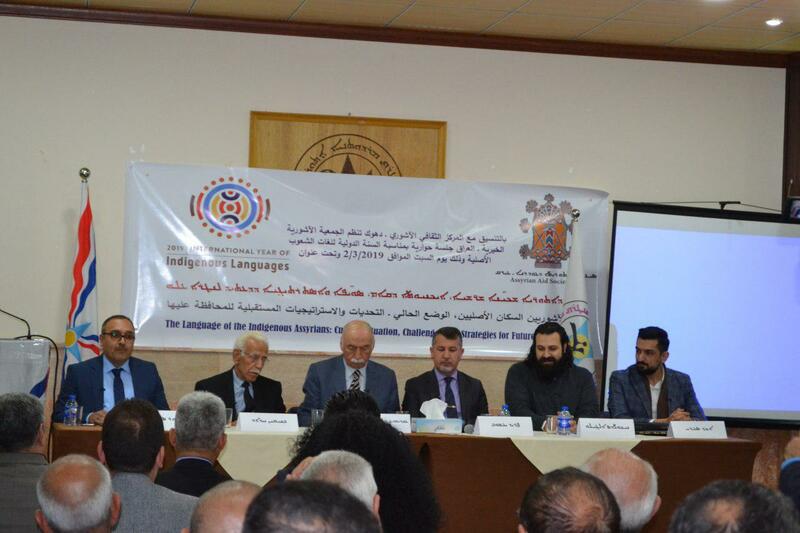 The Assyrian Aid Society-Iraq, in coordination with the Assyrian Cultural Center in Duhok, organized a panel discussion on the occasion of the International Year for Indigenous Languages ​​2019, entitled "the Language of the Indigenous Assyrians: Current Situation, Challenges and Strategies for Future Preservation", on Saturday, Mar. 2nd 2019, at Hammurabi Hall at the Assyrian Cultural Center. The panel were moderated by Mr. Ashur Eskrya, President of the Assyrian Aid Society-Iraq, with the participation of the author and researcher Mr. Benjamin Haddad, the Academic Researcher Dr. Odisho Malko, Dr. Nicholas Al-Jeloo teacher at the Turkish Kadir Has University and Mr. Akkad Saadi, President of the Bet Kanu Foundation in Qamishli, Syria, with the attendance and participation of many representatives of civil society organizations and those interested of our people. The panel discussion consisted of several themes, including the stages of development of the Syriac language and the available means to preserve and revive it as a valuable cultural heritage inherited by our people as one of the indigenous peoples, and discussed through the presentation of many ideas and opinions to preserve it as the language of the indigenous peoples in the region for centuries and for its importance to the Chaldean Assyrian Syriac people, using of modern and technological means to preserve the Syriac language in its eastern and western branches and opening the discussion to participating audience. At the conclusion of the panel discussion, an art exhibition of the Syriac Calligraphy of the artist Alan Shmuel was opened, which included the presentation of many paintings and works of art in the Syriac language.